The mountain range of the Himalayas, meaning 'Abode of Snow', stretches from Jammu & Kashmir in north India to Arunachal Pradesh in extreme northeast India. This mountain range divides India from the rest of Asia by its invincible mountain ranges. Even if the mountain range of the Himalayas does not cover the entire northeast India, its smaller ranges reaches up to the remote parts of northeastern states of the country. Therefore it also separates northeast India from the southeast Asian countries. 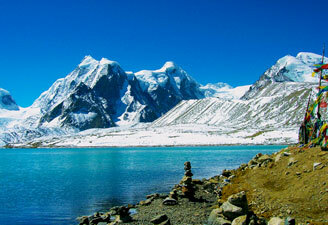 The Himalayas have emerged as a major eco-tourism hub of the country. The lush green thickets amidst the foothills of Shivalik Ranges, snow-capped Dhauladhar range overshadowed by Pir Panjal Ranges and Great Himalayan Ranges are the salient features of these mountain ranges. Enchanting lakes and luxuriant valleys are located here between an altitude of 350 m and about 6,810 m. The mountain ranges are interlinked by rivers and sprawling valleys. The Himalayas are not less than a haven for the visitors as the forests, flora & fauna and natural scenic beauty with salubrious climate are the highlights of these mountain ranges. The alpine land is an ardent destination for Aplinists and a feast of hedonists as it's spread over Lahaul and Spiti to Pangi valley. The medicinal herbs here have been growing in the whole of the region since times immemorial. Another area of tourism activities is adventure sports, yielding greater scope for trekking, camping, mountaineering and skiing etc. 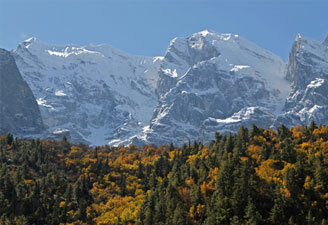 Here follows a brief description of eco-tourism in the Himalayas. The Himalayas home a mind-blowing variety in wildlife resource. Rare medicinal herbs also grow here. There are luxuriant tropical forests of Sal, Teak and Shisham in the Himalayan foothills named as Terai. As you climb, you come across a variety of Chir (Pine), Oak, Deodar, Fir, Rhododendron, Birch and Juniper trees. Rare and endangered species of animals and birds can also be spotted in this region. The Great Himalayan National Park, Himachal Pradesh; Corbett National Park, Uttaranchal; Namdapha National Park, Arunachal Pradesh and The Royal Chitwan Park, Nepal are some of the areas declared as National Park, that were planned for the conservation and protection of wildlife in the region. Indus, Sutlej, Ganga, Yamuna and Brahmaputra are the major Himalayan rivers. These rivers meander through Indian mainland and rush and bounce along irregular surfaces and beautiful meadows. These are central to our history and mythology. Major rivers of the Himalayan group include the Indus, the legendary Ganga and majestic Brahmaputra. Fed by both snow and rain, these rivers flow endlessly round the year. These rivers discharge around 70% of their inflow into the sea which includes around 5% from central Indian rivers. After joining the Ganga, these rivers drain into the Bay of Bengal. The Himalayan rivers are inhabited by a large percentage of aqua lives and creating a favourable ecosystem for freshwater creatures. The Himalayan hill resorts are lush and vibrant. Salubrious climate and rich natural resource here beckon several naturalists, adventurers, environmentalists and biologists. This hidden treasure of the nature is the abode of various kinds of rare flora & fauna. 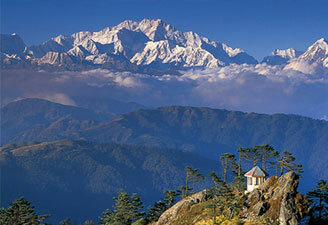 Almost all the hill stations located here represent something different from the other. Some important hill locations here include - Srinagar, Ladakh, Shimla, Gulmarg & Sonamarg, Dharamsala, Dalhousie, Kullu, Manali, Sarahan, Nainital, Mussoorie, Rishikesh, Kailash Mansarovar, Gangtok and Darjeeling. Ancient Hindu scriptures mention that the original inhabitants of the Himalayas were Kulinds, Kiratas and Kilinds, Kiratas and Kinnars. Some later texts mention Khasas and Darads as the inhabitants of the Himalayas. Three ethnic groups known as Negroids, Mongoloids and Aryans constitute the Himalayan population.